The time frame in which you can expect to notice muscle gain depends on several factors: your current fitness level, the intensity and consistency of your workouts and your body fat percentage. You may notice strength gains before you feel a change in muscle size, at which time you also should see visible results. 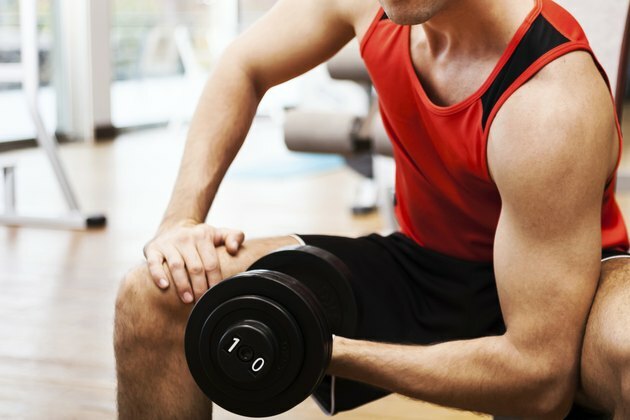 According to the National Academy of Sports Medicine, those who are new to exercise can expect to notice muscle gain within four weeks of beginning a strength-training program. Body fat acts like a blanket covering your muscles. The more fat, the less visible your underlying muscles. The American Council on Exercise suggests male athletes maintain a body fat percentage between 6 and 13 percent, whereas female athletes should aim for between 14 and 20 percent. With a lower body-fat percentage, you can visibly notice muscle gain more easily. Building muscle size requires fatiguing a muscle within eight to 12 repetitions of a given exercise in each set of exercises. Performing greater repetitions -- 20 to 25 per set, for example -- yields muscle endurance, but does not necessarily make bigger muscles. To maintain muscle size and strength, engage in at least two resistance workouts weekly. To increase your fitness level, however, perform strength-training workouts every other day. Contrary to popular belief, you do not build muscle while lifting weights; you build it during the recovery time. In the gym, you’re actually breaking down muscle and producing microscopic tears. During down time, your muscles repair themselves and increase in size. Exercising on consecutive days can actually have negative effects, instead of leading to muscle growth. Because muscles are made of bundles of fibers, achieving muscle size and strength gain quickly requires targeting all of a muscle’s various fibers. A single exercise, such as biceps curls, targets only one segment of the biceps muscle fibers. To target the remaining fibers, work the muscle from different angles by performing other biceps exercises, such as chin-ups, hammer curls and seated angle curls. Vary your exercises with every workout, versus waiting until weekly or monthly intervals to make program changes. Perform standing exercises using free weights instead of machines for faster muscle gains. Resistance machines typically involve seated maneuvers that target only one muscle group at a time. Performing exercises that target multiple muscle groups simultaneously -- such as a one-leg squat with reverse wood chop -- burns more calories, maximizes strength gains and saves time. NASM Essentials of Personal Fitness Training; M. Clark et al. Can You Build Muscles in One Week?